Kickstarter, while being a norm of the board game industry for a few years now, is still a difficult and occasionally oppressive storefront to explore. With so many projects launched and so few dollars to spend, one must be weary of vapid designs, manipulative campaigns, too-good-to-be-true promises, and shady stretch goals. While the Tidal Blades Kickstarter flirts with some of the now-traditional practices that I’ve grown to resent kickstarter for, Druid City Games presents themselves as earnest creators who are respectful of potential buyers, in efforts to create an exciting and well made game to explore. Which would be much more speculative if I couldn’t definitely tell you, yeah. The game is good. 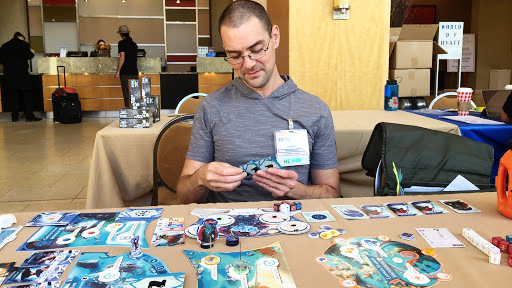 This past weekend at the Metatopia gaming convention, I had the chance to play a demo version of the game, courtesy of game designer Ian Moss, who is slated to work on the follow-up game in the series, Tidal Blades: Rise of the Unfolders, alongside Jon Gilmore. And while I only had the chance to give the game one playthrough, I was impressed by the ideas, style, and overall experience Tidal Blades brought to the table. At its core, Tidal Blades merges worker placement, resource management, and dice building mechanics to create a wonderfully unique gaming blend that is only accentuated by the engaging theme. Players are tasked with proving themselves to be the champion and protector of the island by pushing themselves through various challenges, all while attempting to fight off monsters, impress the elder of the island, and upgrade their gear to better take on the ever-escalating danger. 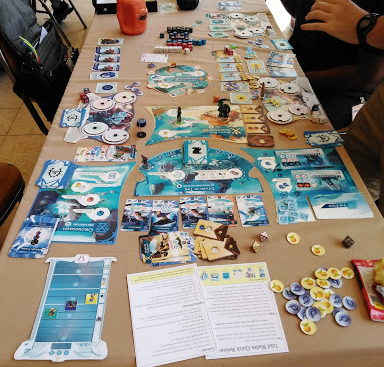 The setting is a seaside island surrounded by gorgeous Pacific Island and reef motifs that looks unique alongside the other games on your average board game shelf. You could categorize it as fantasy, sure, but it steps away from the usual shitck of elves and dragons and gives us a taste of a new, fascinating vision of what the fantastical can be. In proper worker placement manner, players are only given 5 rounds to make the best of what few actions they have access to, as well as whatever pitiful resources they can manage to scrape up in that time. Turns are simple yet agonizing; players choose one spot for their hero to journey to, exhausting the resources on that spot, activating that location’s ability, and potentially taking on a challenge played from their hand. Above all else, players are trying to build their dice in interesting and strategic ways. Players start with a couple of white, basic dice that represents all 4 symbols evenly, leaving two remaining sides for a wild and a blank. Dice are rolled most often to try and complete the aforementioned challenges, collections of symbols, that must be completed in the three specific testing ground. So it stands to reason that the better your dice are, the easier it is to complete these challenges, right? But the game gives you a hard choice - When you upgrade one of your meager white dice, it changes to a specialist die, either blue or red, each favoring half of the symbols. This means that for the 2nd and 3rd dice levels, you have greater potency, but less flexibility, forcing you to consider what challenges you want to attempt and how to better balance yourself within all 4 symbols. The final dice level allows you to choose a die the specializes in a single symbol, possibly providing 2 of that symbol on certain rolls. This system of fine tuning your pool to it’s ultimate specificity feels harsh, deliberate, and awesome. The other resources players handle are fruits and shells. Shells protect players’ dice from the dangers of the island, as each time you roll for a challenge, you must also roll a danger die, which could destroy some of your dice for good. On the other hand, fruit, being nutritious and all, allows you to roll more dice than normally possible, as is dictated by your Focus level. That’s right, players have stats that they can upgrade and customize over the course of the game. The easiest way to do this is through completing challenges, giving you bumps in the associated symbols, though there are some other means of going about this. Focus dictates how many dice you can roll a turn, Spirit the strength of Stunt cards, Synergy expands your character’s tableau of abilities, and Resilience lets you upgrade more dice between rounds. This leads us to the various locations, each of which ties into a particular theme and mechanic that will help you on your journey. The Chronosseum, for instance, focuses on allowing you to draw stunt cards, which will get you various boosts to your stats, dice, and more based on your Spirit level. And the Drosaka Ring has a market where you can spend your fruit to get other currencies, often at better prices than elsewhere. The Lamara Stadium earns players with a number of resources based on where the boat that surrounds the stadium is moving to when you get there. These 3 locations are where you’ll be able to complete challenges, with each challenge forcing you to be at a specific board. Your rewards will be amplified, however, if the Elder is there to watch you. Each round, he moves from board to board, making it more profitable to complete challenges in a certain area while also making it more difficult to fight with your opponents for the limited free spots. The other two locations, however, allow anyone to use their spots as many times as desired, and neither have any challenges specific to them. The Citadel of Time helps players reclaim their dice or gain some extra resources, all while being the only way to get more challenges. Tired of going to Drosaka Ring, or looking to upgrade a particular stat? Here, you can choose from a line-up which challenges are most helpful to you, letting you plan for the turns ahead. And along the Fold looms the impending threat of monsters as they lurk ever closer to the islands. At the end of each round, monsters will attempt to invade the protagonists’ homes, causing chaos and damage. Players can attack them, using their dice to deal hits and gain points, but any dice used in this manner are lost to the sea, meaning players will be making sacrifices to succeed. Lastly, the Champion Board tracks another method of earning points; as you accomplish feats before the Elder, as well as accomplish various tasks around the islands, you will gain levels on the track, gaining you bonus points and extra resources between rounds. Oh, and did I mention character cards? Each character has a pool of cards that builds into a personal tableau over the course of the game. If a player upgrades their Synergy stat enough, they will get to draw into 2 player specific cards, keeping only 1 of their choice while effectively removing the other from the game, meaning each game can play out differently depending on how you draw into said cards, not to mention which character you choose. This all culminates into the final scoring, awarding points based on the Champion Board, damaged monsters, the levels on your stats, the challenges completed, set bonuses for varying your challenge locations, and a secret goal card that each player gets, which are player specific and randomized at game start. As I alluded to earlier, kickstarter is in a weird place these days. Within our hobby it’s in vogue to hate on Kickstarter, yet project after project proves successful, and some of the most beloved games in recent years such as Scythe, Gloomhaven and Spirit Island all found their start on the big KS..
Much of this reaction is that many of us have been burned by at least one KS project, and there are a number of companies who have taken advantage of the platform to pump out games that fund each year within minutes. Tidal Blades, in some ways, shares that identity, having been funded in 45 minutes and created by an established (albeit it newer and smaller) game company, but Druid City Games has made efforts to run about as transparent and consumer focused campaign as one can expect to find. Many of the stretch goals are unlocked day to day instead of relying on consumer funding or engagement, acting as natural reveals already implemented in the game rather than additions created solely to boost sales. The only stretch goals that are influenced by backers’ dollars are those that make the components higher quality. The information provided is expansive and in-depth, providing a feeling of confidence and trust. And what Kickstarter exclusive content there is are either aesthetic upgrades or better means of storing the game. In earnest, I do feel like this is an example of a Kickstarter done right, presenting a strong product while treating buyers with respect and appreciation. While my time with Tidal Blades was brief, it certainly left a strong impression on me. The decisions and options at play are deep and varied, offering a wide variety of avenues and options to choose from. This is only compounded by the distinct characters, each with their own options and card pools to pull from. Turns are simple, with each action being straightforward, but how you chain the turns and use your actions wisely is what makes a competitive game that, in my experience, ended in tight scoring. The art speaks for itself, but wow, even in prototype form, this is a game to marvel and appreciate. I couldn’t help but look over the character boards in awe, sort through the various cards, and be stunned by the bright colors and distinct visuals at play. It certainly helps that there are a ton of components to show off the skill at play, but any one piece, when isolated, is stunning on its own. There’s a ton of stuff in the box, though, and I can easily see the game’s girth teetering from astonishing to overwhelming, especially when you first set it up. Dozens of dice, tokens, and cards need to be sorted, organized into different locations, and laid out in specific manners depending on the board they are associated with. Also, with 5 boards for players to interact with, personal player boards, the character tableaus, and each person’s dice pool, this game takes an exorbitant amount of space, struggling to fit on your average table. It’s manageable, but daunting. The same could be said of your first few turns dipping your toe into this ocean of choices. It’s never so much as to leave you completely dumbfounded or caught in a nasty case of analysis paralysis, but there’s enough at play to make you at least double check your calculations before commtiting to your move. My biggest concern is game end; while much of the build-up to the final turn is malleable and will certainly vary game-to-game, certain end-game actions seem inevitable. It feels like a no-brainer to spend all your dice fighting monsters for your last action, or at least to some extent on your last turn, since leftover dice don’t earn you any points. Also, Tidal Waves presents a comfortable loop of gathering resources until you can complete your challenges, then get more, rinse, and repeat. While I don’t have any issue with this core loop, I can see some people growing bored with a lightly repetitive system, even if there’s a fair amount of variety within. All in all, I had a great time with Tidal Waves and would certainly like to revisit it in the future. The systems are rich and robust, the world fleshed-out and unique, the art gorgeous and inviting, and gameplay fun and involving. 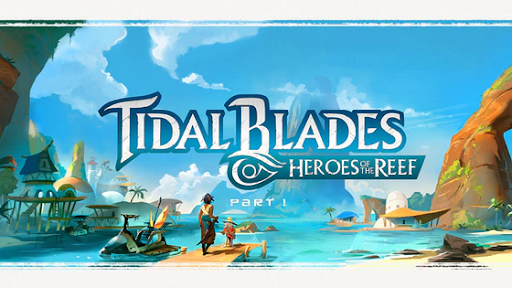 I can’t ask for much else from a board game experience at the end of the day, leaving me pleasantly surprised and excited to see where the world of Tidal Blades goes next. Full disclosure - Jack Eddy, chief editor of TCbH is a backer of Tidal Blades but did not commission this article.